The Alchemist is a tiny little brewpub in Waterbury, Vermont. Yeah, you know what that means, right? 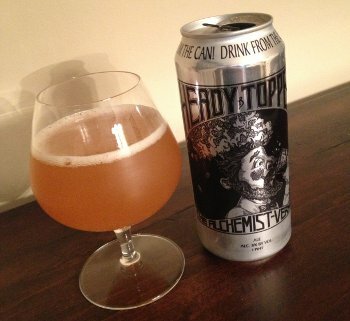 They've been around since 2003, but their notoriety has gone through the roof in the past few years due to their flagship (and, for the most part, only commercially available) beer Heady Topper. Back in 2011, their brewpub was destroyed by Hurricane Irene just days before their cannery went online (the cannery was luckily spared from the devastation). Already a well respected brew, once Heady hit cans, its reputation exploded. Even today, The Alchemist supposedly can't produce enough of the stuff. I've heard tell of small caches of these suckers making their way to Boston and Philly, but that seems to happen rarely. Somehow, I managed to get my hands on a few cans (my purveyor wishes to remain anonymous, but I'm very grateful). 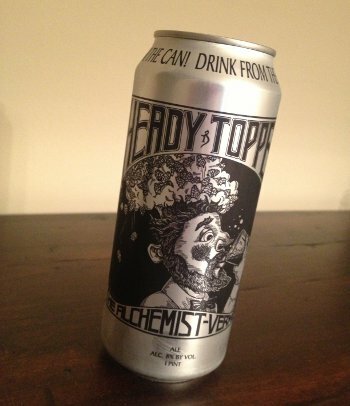 Beer Nerd Details: 8% ABV canned (16 ounce pounder). Drank out of the can, like a man. (Or a snifter). So yeah, this is the real deal (and I ain't the only one who thinks so: Jay, Ed, DDB, Dave, and Rich all seem to love the stuff). They do make other beers on occasion (and I even had the good fortune to try their most excellent collaboration with Hill Farmstead, a 4% "blonde" called Walden, which was kinda like Heady's even more drinkable little brother), but this one alone is worth the stretch. That trip to Vermont is getting more attractive by the moment. This page contains a single entry by Mark published on July 18, 2013 10:17 PM. Jack's Abby Leisure Time Lager was the previous entry in this blog. De Molen Hel & Verdoemenis is the next entry in this blog.